Way to go boys! From the first TD to the amazing Matt Trannon pass TD this has been all MSU! 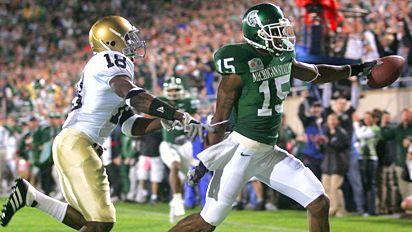 While there was a clear shift in momentum when #18 from ND made a late hit on Drew Stanton out of bounds (which then lead to an angry Matt Trannon getting a personal for fighting back) – MSU is holding strong. Bottom line: ND is not keeping up with the better athletes on the MSU team. UPDATE: Well, here we go again! MSU has a huge lead, then falls apart in the 4th. Was it the rain and wind? doubtfull. ND certainly came back and played harder (which I still contend that they are over-rated). Let’s hope we can regain our composure for Illinois next week at the homecoming game.